At One Central Park, discover a coddling environment that leaves you feeling pampered every minute of your waking hour. Just downstairs is a four-story mall with chic boutiques and cozy spots awash in luxury for body and soul. And just outside the mall is a park studded with palm trees and tropical blossoms, and a breathtaking lagoon that melts the day's cares away. Your home at One Central Park is redolent with luxury. The verve and vibrancy of its architecture is evident in its striking glass and concrete facade. The floor-to-ceiling windows in your living room treat you to expansive views of the central park and its centerpiece lagoon to the West, the Antipolo mountain ridge to the East, the City Walk to the South and the verdant podium deck to the Northwest. Be it a studio pad or a two-bedroom suite, your home has been meticulously designed and crafted to your expectations. And with five levels of basement parking, four high-speed passenger elevators and a helipad on the roof deck, enjoy every day with utmost ease. FLOOR AREA 70 sq.m. / 754 sq.ft. OTHER INFORMATION Eastwood Mall is on the 1st to 4th floors of the building. 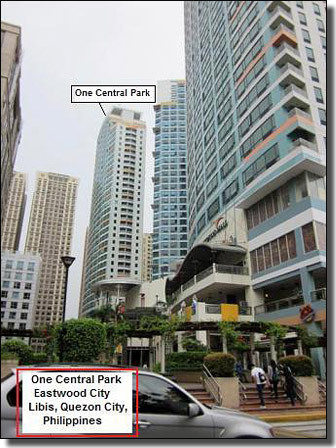 Eastwood City Walk and entertainment places are just minutes walk away. 15 minutes to airport, piers, universities, major call centers, and government offices. 5. Reservation Deposit: P5,000 ($116) to confirm reservation & hold the unit. Refundable on move-out day less any damage or missing items.